The words “young adult” is correlated with teen angst films with an incredibly cheesy romantic plot. There’s a certain negative connotation with the words “young adult novels.” For regular moviegoers, young adult adaptations are synonymous with Twilight or The Hunger Games. However, whatever you may think of the subgenre, film adaptations will continue to be made. Is the latest adaptation, Miss Peregrine’s Home for Peculiar Children, a step up for the subgenre or does it serve as another example of terrible YA adaptations. 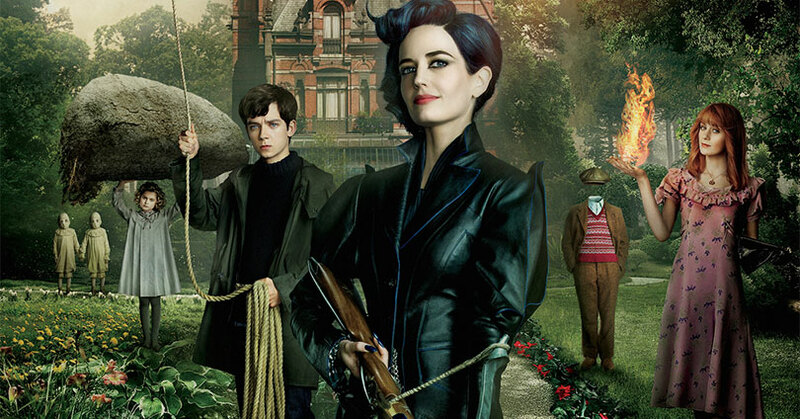 Thankfully, Miss Peregrine’s Home for Peculiar Children isn’t your typical “young adult” adaptation. It’s much different than your average YA adaptation and that’s because of Tim Burton and Jane Goldman. The combination of Tim Burton’s visuals and Goldman’s script results in a dark, funny, and heartfelt adaptation of the young adult novel. Miss Peregrine’s Home for Peculiar Children follows Jake, whose grandfather told him grand stories of Miss Peregrine and her special home since he was a kid. When his grandfather gets murdered, he goes on a journey to find clues to the whereabouts of Miss Peregrine’s home to put closure on his grandfather’s murder. He inadvertently discovers a world so peculiar that it’ll change his life forever. Miss Peregrine’s Home for Peculiar Children feels different from Tim Burton’s recent films. You get a sense that Miss Peregrine feels like a return to the superhero genre for the director, that this is Tim Burton’s version of X-Men. Much of this is due to screenwriter Jane Goldman, the writer of First Class and Days of Future Past. Because of her work on Days of Future Past, Goldman is able to nicely balance the present day and 40s era. The bifurcated storyline allowed Burton a lot of room to make the film manageable. The present day is where most of the quieter moments are found. In the past, there’s much more time for character beats and where most of the “peculiar” elements go. While I won’t get into spoiler territory, the film does have some glaring plot holes. When you’re dealing with anything involving time, there will always be some unanswered questions. Also, there are a lot of complex story elements that resulted in the film dragging during its long exposition scenes. Fortunately, the film is entertaining enough to overlook these issues. But Tim Burton fans will be glad to know that the gothic aesthetic of Tim Burton is still there. Burton is at his best when he works with dark fairy tale themes and is able to put his fantastical imagination to work. Even with Miss Peregrine being a young adult novel, Burton is able to call upon his classic films while implementing his new tricks. The character designs of each peculiar, Ymbryne, Wights, and Hollowgasts are great. Art directors Greg Berry, Rod McLean, and Mark Scruton clearly were inspired by the eerie Halloween costumes of the 40s for the look of the twins while the other peculiars all look era-appropriate. In addition, the hollows are frightening and look like something out of Silent Hill. The Ymbryne looks similar to the birds they turn into and the Wights are creepy with their all white eyes. With as many characters in the film, some of the cast’s most recognizable names are set aside in order to let the film’s young actors shine. Samuel L. Jackson, Dame Judi Dench, Allison Janney, Chris O’Dowd, and Terence Stamp doesn’t have a lot of screentime in the film. Although Stamp has a small part, his heartwarming and touching scenes stand out the most in the film. He brings the heart to the film. Samuel L. Jackson also brings a funny and hammy performance to his villainous character. However, for a villain, Jackson isn’t given much time to ham it up, for better or worse. Ella Purnell shines as the love interest of Asa Butterfield. She’s able to convey a wide array of emotions and brings a lot of depth to her character. Asa Butterfield, on the other hand, seemingly struggles with his accent and doesn’t seem to have much chemistry with Purnell. Finlay MacMillan also does well as Enoch O’Conner with the way that he conveys a jealous and devious side to his character. Lauren McCrostie is a bit forgettable as Olive, and the rest of peculiars aren’t featured as much as the Jake, Emma, Enoch, and Olive. Eva Green is a bit of a conundrum. She delivers her lines in a one-note performance for most of the film but she is delightfully emotional with her facial expressions. When she does break out of her one-note performance, she is one tough mother. She brings a mean toughness when she’s protecting her children. Overall, Miss Peregrine’s Home for Peculiar Children is an entertaining adaptation of the young adult novel. The comparisons to the X-Men will be made, but Burton is able to add some of his magic to an adaptation that’s right in his wheelhouse. There are several issues with the film but Tim Burton fans and fans of the book will thoroughly enjoy this film.